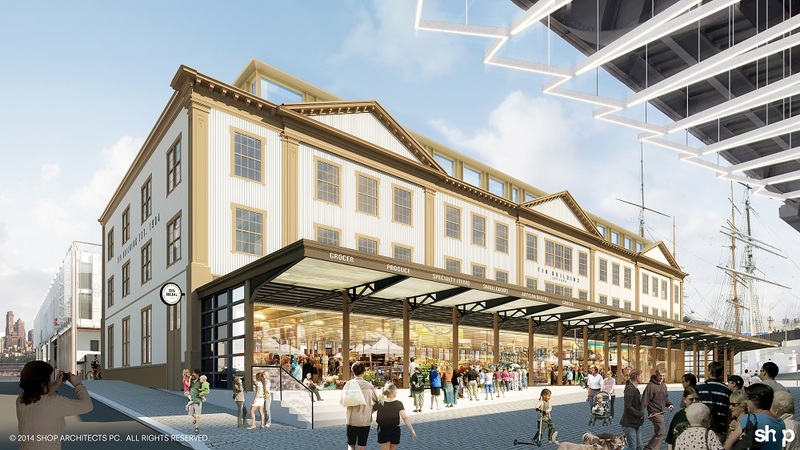 Less than a week after it was revealed that the Howard Hughes Corporation paid $31 million for more than 300,000 square feet of air rights at the South Street Seaport, it looks like the entire $1.5 billion redevelopment project could be stalled. The overall plan would breathe new life into the downtown historic district by rehabilitating crumbling piers, preserving and finding new use for landmark buildings and constructing a 42-story waterfront condo tower at the foot of Beekman Street. And it’s this last point that has local officials, civic groups, preservationists and some community residents worried or downright angry. The 494-foot-tall, SHoP Architects-designed tower has already been scaled back from its original 650 feet, but concerned parties still feel that the building would “obscure views of the Brooklyn Bridge and clash with the low-scaled, early-19th-century brick buildings that make up the 11-block seaport district, once the center of the city’s maritime industry,” according to the New York Times. According to Wiley Norvell, a spokesman for Alicia Glen, the deputy mayor for economic development: “The administration has a strong interest in preserving the maritime heritage of the seaport, including the historic ships and the museum. We’re in ongoing discussions with the community and its elected officials, as well as the private developer, to see if we can achieve that critical objective and satisfy other priorities the neighborhood has raised.” David R. Weinreb, chief executive of Howard Hughes, said that his company’s goals align with this and that the condo tower would provide the necessary revenue to include community incentives like building a middle school, renovating the historic Tin Building, and creating a new home for the South Street Seaport Museum. But some elected officials, including Manhattan Borough President Gale Brewer, say the developer needs to completely start over. Howard Hughes has been meeting with concerned and/or interested parties for the past year, even forming their own group of supporters called Friends of the Seaport. According to a poll they conducted, 80 percent of local residents support the project. 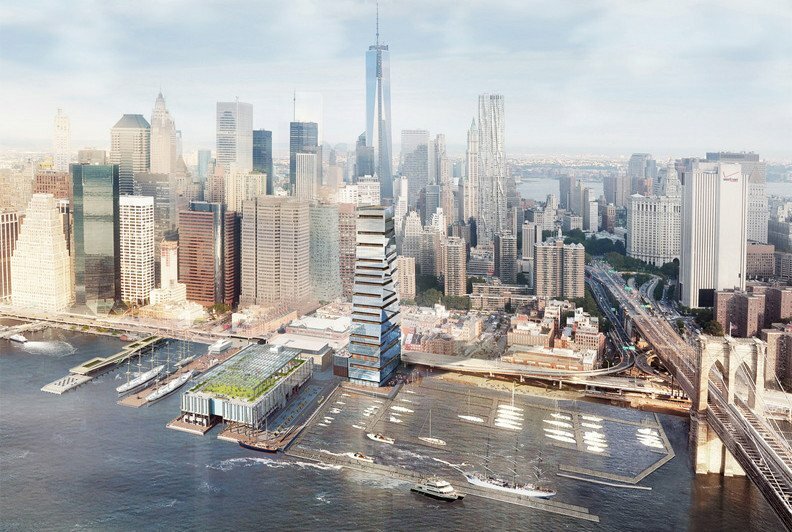 Whether or not that figure is accurate will surely come to light in the near future as the debate over the South Street Seaport and its controversial condo tower heats up. Another major problem with this development is that tropical rainforest hardwoods have been specified for the entire deck. We’ve met with Howard Hughes Corporation (HHC) VPs, who told us that jatoba (often called “Brazilian cherry” in the U.S.) is currently specified for the redecking — and that it was suggested to them by New York City Economic Development Corporation (NYCEDC). This, despite Mayor Bloomberg’s call for a phase-out of the use of tropical hardwoods by city agencies, as a result of our 15-year campaign. Oh, but NYCEDC *isn’t* a city agency (even though they act like one) (and neither is HHC), yet they’ve been tasked with developing this public land — yet, they don’t have to abide city policies! Indeed, the use of tropical hardwoods is pervasive in lower Manhattan, with all the decking in Hudson River Park made of ipê, another Amazon rainforest wood; the railings and benches, too. And all the benches in Battery Park City Park. Oh, and those in The Battery. And, while while I’m ‘down there’… all the pilings at the end of The Battery as well as the tens of thousands in the fender racks of the Staten Island Ferry terminals. Oh, and East River Park — and the newly-renovated Pier 15. Oh, and the decking of the Brooklyn Bridge… and Fulton Ferry Terminal. And just for good measure, most of the new track ties in the entire NYC Subway line. Not to mention the uses in the other boroughs, such as for the Coney Island Boardwalk and the two-mile-long boardwalk in Staten Island. *All* rainforest wood, ripped mostly from the Amazon, but also from Guyana and West Africa. Indeed, at this point, there’s more rainforest wood in southern Manhattan than many stripped rainforests in the tropics. Given the loss of species and the role that logging plays in deforestation (it’s the primary factor), and the greenhouse gas emissions due to deforestation (25 – 30% of human-caused emissions), this has been one big cataclysmic catastrophe — and it has to stop here! Please contact us to help stop this impending additional use, and help HHC shift to alternatives.